The importance of a warehouse to a business is often understated. Your warehouse is home to much of your business’ assets. If your warehouse were to be compromised in any way, much of the stock, storage or equipment inside would be at risk, potentially leading to debilitating consequences for your business. Unfortunately, detrimental warehouse problems occur all too often, with vandalism, thievery and fire being the most common causes. Installing a high-quality security door on your warehouse will bolster its security and fire-resistance, minimising any potential harm. There a variety of security and fire doors currently on the market, each suited to different areas of your warehouse. 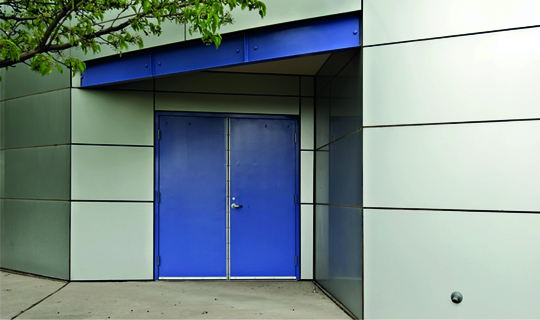 In this article, Royal Industrial Doors are going to assess each of these products and discuss which options are optimal for front, back and external use. The front door will be the most used entryway into your warehouse. It is important, then, that front doors are accessible in addition to being secure. Implementing a highly robust door that takes a long time to open and close will not be practical for use as a front door. These doors are perfect for use at the front of your warehouse thanks to their combination of security and accessibility. Easy to open with a pull of the handle and simple to secure with a turn of the lock, swinging doors help keep your warehouse secure without deterring people from entering. You could also add CCTV cameras to boost security if you wish. Some warehouses will require large equipment, such as forklifts, to enter and exit the premises regularly, and high speed doors are the perfect choice for such a requirement. Sectional overhead doors slightly compromise on speed of access in exchange for heightened security features. Sectional overhead doors are a good option when entry and exit of forklifts, or other large equipment, are uncommon but not entirely unemployed. Back doors are often prime targets for criminals. It is, therefore, extremely important you invest in a back door that offers high levels of security. These doors are relatively modest looking but feature a series of heavy duty steel locks that make them extremely secure against intrusion. Add an extra layer of security on your premises by installing security features to the outside grounds, such as a car park. This will help to regulate which vehicles enter the grounds, heightening security and allowing you to keep track of who is on the premises. 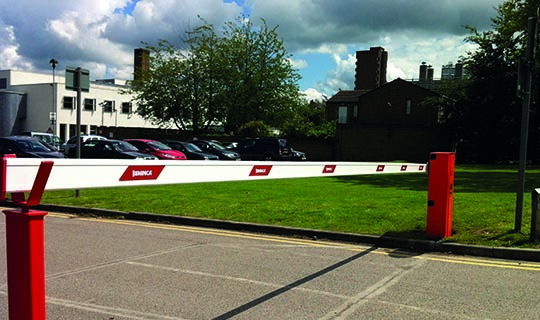 Barriers will automatically prevent or permit cars from entering your car park, giving access only to those authorised to be there. These stylish gates add aesthetic to your premises while also boosting security. Complete with an intercom system, you can speak directly to anyone you are suspicious of and choose whether or not to open the gate to your premises. There are a number of doors you can use you can use to prevent or reduce the risk of a fire in your warehouse. It is a legal requirement for a warehouse to have a fire exit door. 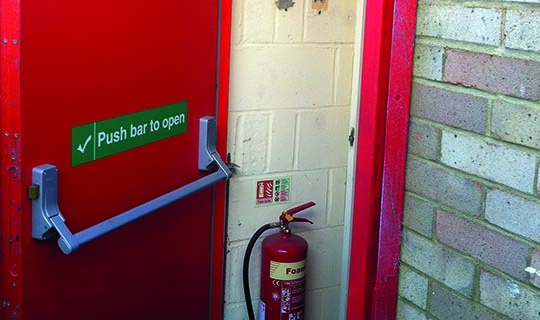 Fire exit doors ensure that a fireproof evacuation point is available for quick, safe exiting of the premises. Fire shutters can help to minimise the chance of a fire spreading. They work by compartmentalising your building once a fire has been detected. Shutters will automatically roll down, isolating a fire and preventing it from spreading throughout the warehouse. This is especially important if your warehouse contains many flammable items. 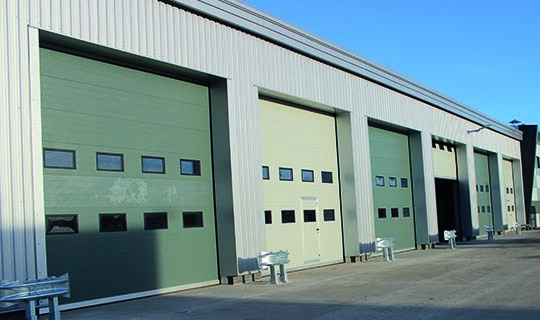 Royal Industrial Doors provide a wide variety of security and fire safety doors, catering for both domestic and commercial clients. With over 25 years’ experience in the industry, we will provide the strictest levels of security and safety to any establishment throughout Luton, Stevenage, Milton Keynes and Bedfordshire. To enquire further about any of our products or services, give our friendly team a call today.